Don't let your students face college unprepared. Get them ready. College Ready. Incoming college students need to feel confident about the new experience that awaits them. You can equip them with this fast-paced, informative resource designed to help high school seniors and college freshmen think clearly, wisely, and strategically about the college years ahead. 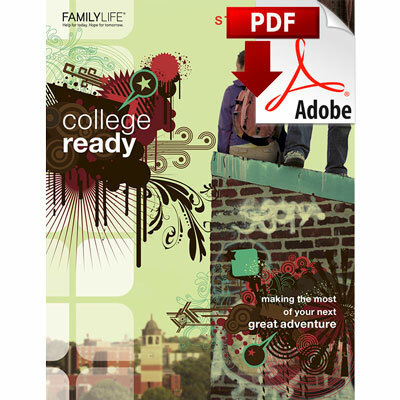 The College Ready student guide, designed in a contemporary magazine format, is full of fun graphics, text boxes, charts, and diverse teen images. In addition to the outline of the video talks on the Leader Kit DVDs, the guide includes insightful supplemental resource material such as topically related articles, insightful quizzes, fun facts, memorable quotes, interactive activities, and invaluable information such as "How to Find a Campus Ministry." The student guide also features discussion questions at the end of each session for meaningful group discussion and a "My College Vision" sheet at the back of the guide. NOTE: The Leader Kit with session DVDs is no longer available from FamilyLife. Copies may be available at CBD.com. John Bryson is the cofounder and teaching pastor of Fellowship Memphis. He is an avid indoorsman but occasionally enjoys golf, fishing, and road trips. A transplanted Kentuckian, John still loves his Wildcats and enjoys great coffee, a good read, and any decent movie. He and his wife, Beth, deeply enjoy hanging with their 2 kids. Robert Lewis is the executive producer of College Ready. He hails from the state of Arkansas where in his college days he played linebacker, and is now an armchair quarterback for the Razorbacks. Originally a Louisiana boy, Robert loves Cajun food as well as chocolate and playing guitar. He enjoys reading, traveling with his wife, Sherard, wrestling with his grandkids, and has all the Beatles' songs memorized.